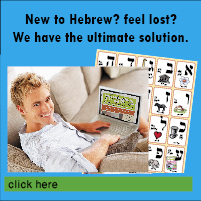 I put this catalogue site together because when I started looking into how I would learn Hebrew, several years ago, I started collecting websites. But I had some saved on my work computer and some on my home computer. I got fed up with sending website addresses back and forth and never having the one I wanted where I needed it. So... the solution was obvious. But then, why not make it available to other people, after all I can't be the only one doing this and I hadn't seen this type of catalogue site for modern Hebrew anywhere on my virtual travels. In March 2009 I added Google Analytics to give me some idea of how much traffic there was on the site. Well, was I ever surprised. Far from being the tiny site that only I probably ever visited, it's actually much more 'popular' than that, even though most visits are one-off probably for curiosity. Although that does show that there is a huge amount of interest in learning Hebrew out there. Although there are only limited resources for learning modern Hebrew available in shops, and most of the time information about them is patchy and courses and dictionaries will need to be ordered specially, the Internet holds a wealth of materials. Some are proper courses, some are merely vocabulary lists (not very useful as only the masculine singular forms are usually given), while others are useful resources to accompany any other course you might be taking. I wanted to publish all of these things to make it easier for others in my situation to sift through the many sites, and also to highlight modern Hebrew resources, as so much out there is dedicated to Biblical Hebrew. Initially I thought I might briefly review each site but on reflection I reckon that reviews are often unfairly subjective as some sites that I might not find useful might be useful to others, depending on needs and expectations. When I do make comments I try to make them objective. Cost can be an issue when investing in a language course, but if you work out how much each individual lesson costs and how much you are learning for that money (i.e. how many words of vocabulary, the level of proficiency you reach at the end), you will find that the cost may be high but that it is nevertheless not expensive. The important thing is that it is money well spent. Above all, do not expect to achieve anything at a useful level in a language without shelling out some cash.